My thanks to John Fraser for the match report. Edinburgh United – David Livie, Mark Kelly, David Thomson, Kevin Murray, Keith Pullen, Kerr Potter, Andy Malone, Darren Pryde, Lee Zavaroni, Steven Finlayson and Ross Elliot. Subs – Conan McDiarmid, Andy Christie, Jamie Hawkins, Ewan McIntosh, Jamie Butler and sub g/k Stewart Burnside. Penicuik Athletic – William Bald, Graham Gallagher, Gary Kennedy, Matthew Lynch, Craig Meikle, Daniel Kelly, Ryan Gay, Keith Barr, Johnny Harvey, Graeme Cole and Paul Coleman. Subs – Dean Walker, Darren Gray, Chris Steel, Petr Korinek, Stuart McKean and sub g/k Raymond Sandison. Edinburgh United produced a battling display to send Penicuik Athletic tumbling out of the Emirates Scottish Junior Cup at the first hurdle. Moonie and Milne were missing from last week’s winning line up against Pumpherston while ex Penicuik player, David Livie lined up in goal for the home team. A strong wind and blustery conditions meant that good football was unlikely and indeed both teams struggled to string their passes together. The home team, with the wind in their favour looked nervous in the opening exchanges and adopted a safety first policy with some no nonsense clearances. Pryde with his dead ball expertise put Penicuik under pressure from two early free kicks and corner kicks. Penicuik were trying to play their way upfield but as often as not found the ball cleared straight back downfield. With twenty minutes gone Livie had to leave his line to save at the feet of the inrushing Harvey. Twice Gay failed to produce a telling cross from the right and from the other side a Coleman cross sailed narrowly over the crossbar as Penicuik enjoyed a spell of pressure. In the twenty sixth minute another Pryde corner flashed across the face of the Penicuik goal but a defender got a touch giving Thomson an opportunity from the other side of the park. However, the wind carried his corner kick out of play. Three minutes later the Penicuik defence got in a terrible tangle but both Malone and Finlayson hesitated and the danger was cleared when a goal looked certain. Livie again saved at Harvey’s feet as Penicuik looked for an opening in a committed home defence. With ten minutes of the half remaining Bald had to get down quickly to save a left foot effort from Elliot as Edinburgh fought back. The game had become a bit of a lottery with both teams first timing almost every ball. Penicuik were given no opportunity to bring the ball down and play as they were harried and hurried into mistakes and frequently caught in possession. With two minutes of the half remaining Edinburgh’s Kelly kicked the ball out for a corner with Harvey at his back. Livie comfortably held Gay’s corner kick and launched the ball down field. Kennedy’s attempted clearing header fell at the feet of ZAVARONI who had time to steady himself before striking a left foot shot past Bald to give his team a priceless lead on the stroke of half time. Penicuik who had struggled to create any clear cut openings in the first half were unchanged as they turned round with the elements in their favour. With a minute gone Gay tried his luck with a long range free kick which was deflected to safety. 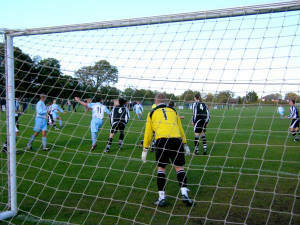 The visitors were unable to trouble home goal keeper Livie who was dealing comfortably with anything that came his way. Cole set up a chance for Gay but again, Livie safely held his left foot effort. 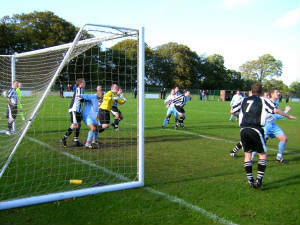 A mistake by Lynch left Elliot, who showed good control with a clear run in on goal but Bald saved the winger’s effort. Another Gay free kick came to nothing before Barr shot weakly into Livie’s arms when an opening presented itself. Walker replaced the injured Kennedy as Gay floated in another fruitless free kick. Edinburgh broke quickly up the park from the kick and Danny Kelly was on hand to clear David Thomson’s net bound shot. Pryde sent in another dangerous cross before Bald produced the save of the match to push away a Potter header at his left hand post. Penicuik in turn broke quickly up the park only for Livie to come out of his box to unceremoniously boot the ball to safety over the grandstand. Another Gay shot went high over the bar before the referee incurred the Penicuik support’s wrath, pulling Harvey up for offside when it appeared that two players on the other side of the park were playing him on. Gray replaced Kelly in Penicuik’s toiling midfield before the confident Livie comfortably held a weakish snapshot from Harvey. Edinburgh again almost hit Penicuik on the break but Gay was on hand to clear Malone’s powerful header off the line. Barr was dispossessed in midfield as Penicuik toiled to break down a hard working home team. Another Gallagher free kick was over hit as the wind continued to disrupt play. Steel replaced Cole as Penicuik were desperately searching for the equaliser. With seven minutes remaining Gray ballooned the ball high over the bar following a Meikle throw in. A wind assisted Lynch free kick was missed by every-one but bounced narrowly over the bar. With the ninety minutes gone, forcing play by Steel and Coleman created a chance for Harvey but Penicuik’s top scorer shot over the bar. The best chance of the game fell to Edinburgh’s Elliot as he broke quickly upfield and ran right through the middle of the Penicuik defence but he hit his parting shot wide of Bald’s left hand post. Edinburgh were overjoyed to move into the second round of the national competition with ecstatic celebrations after the final whistle leaving Penicuik to reflect on a sub standard performance.